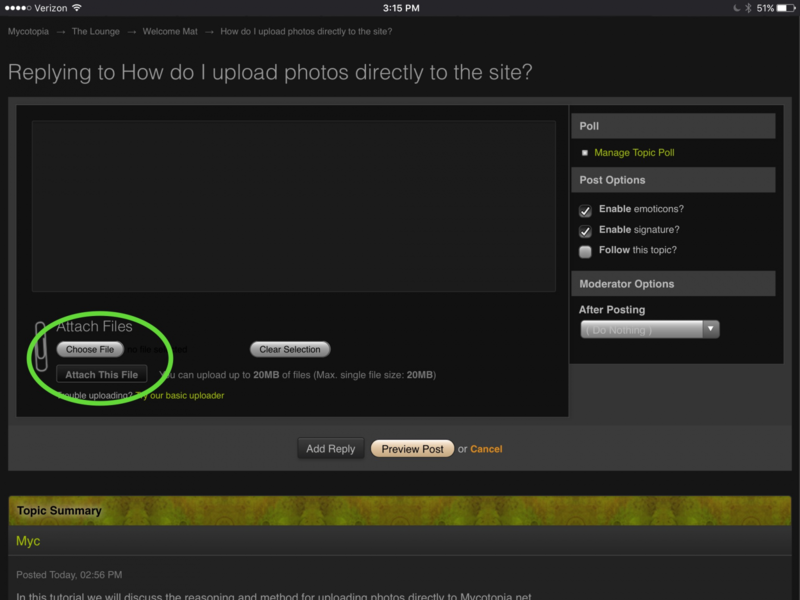 In this tutorial we will discuss the reasoning and method for uploading photos directly to Mycotopia.net. 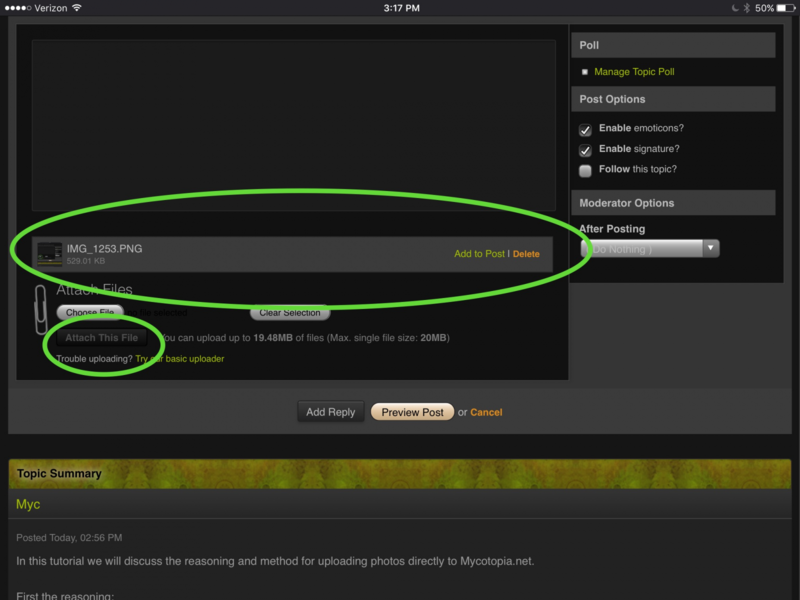 Mycotopia.net has outlasted dozens of offsite photo storage schemes. Once these platforms are abandoned - whether due to user neglect or management issues - the links to those sites become un-reliable and are often broken in some way. They inevitably become useless dead-ends over time. Many good teks which we have in our archives still have their photos attached - thanks to this rigorous policy of uploading photos directly to the site. When replying to a thread you have a choice to make. 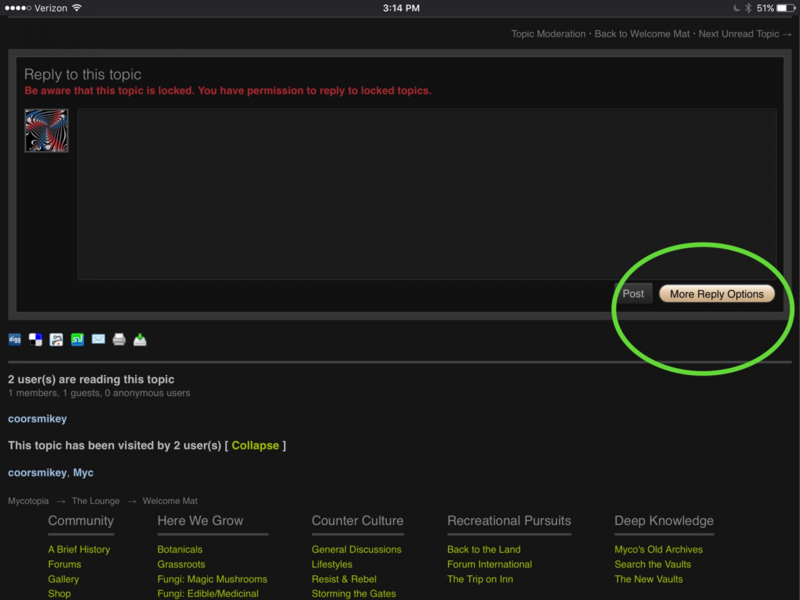 You may use the "quick reply" editor which is located at the bottom of the thread. This editor is pretty stripped-down and lacks some bells and whistles - thus the name "quick reply". If you look at the bottom right-hand corner of the quick-reply text box, you may notice an orange button labeled "more reply options". Selecting this option opens a more comprehensive editor with more options than offered by the quick reply. If you scroll to the bottom of the enhanced editor, you may notice the options to "Attach Files" - with a paperclip icon directly to the left. "Attach This File" will upload the images and attach them to the post. "Add To Post" Put the curser where you want the image to appear in your post and then select. Edited by coorsmikey, 02 February 2019 - 01:52 PM. By perusing the above link you may notice the annoying lack of photographs due to the fact that the OP stopped maintaining their photobucket, imageshack, or other off-site storage service. A great deal of context was lost to future readers. Thank you for understanding and helping keep threads relevant for posterity. Edited by Myc, 20 July 2017 - 07:44 PM.